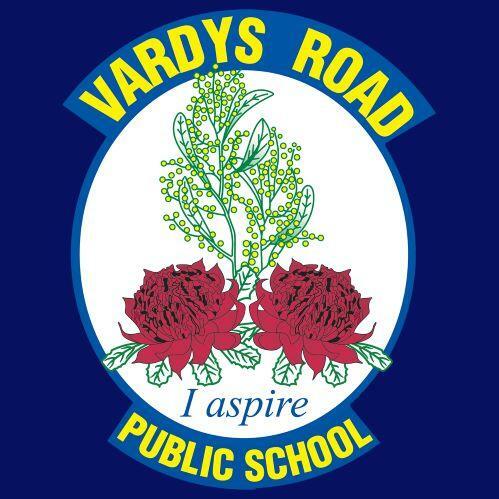 Welcome back to a new school year at Vardys Road Public School. We hope that your family had an enjoyable and relaxing holiday. A special welcome is extended to our new students along with their parents and carers. It looks like 2019 will be a very exciting year. All the Vardys Road teachers worked tirelessly at the end of 2018 and during the holidays, planning the next steps in the school’s Three Year Plan and adding the final touches to their teaching and learning programs for 2019. A big thank you is extended to Terry and Ken, our General Assistants who have worked miracles in managing many projects over the holidays, so that the school is ready for our eager kids… Over the lastmonth they have managed the painting of the hall, the clinic, the administration building and several classrooms, the re-carpeting of five rooms, the removal of some trees and the construction of the yarning circle in the outdoor classroom area near the Vardys Road entrance. Their hard work has definitely allowed for an exciting start to the year. As mentioned above, the first stage of the outdoor classroom project is complete with the yarning circle being ready to use. 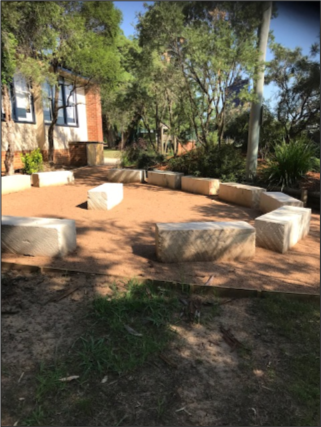 Classes are already starting to use this area and parents are more than welcome to sit on the lovely sandstone blocks and have a chat while waiting for their kids.Many thanks to the community and the P & C for their fundraising efforts that made this project possible. Due to fluctuating student numbers, Year 1-6 students will stay in their 2018 classes for a few days until the student numbers are finalised. Students often enjoy starting the new year with their previous year class mates and it sometimes allows for a stress-free start to Term 1. As soon as numbers are finalised the children will be placed with their new teachers and the 2019 classes will be included in next week’s newsletter. Many thanks in anticipation of your understanding of this unavoidable situation. We have a number of new teachers who are excited to join the Vardys Road team. They include: Mrs Kylie Picot, Ms Rachel Bernays, Mrs Brigette Harrison, Miss Nicole Sclavenitis, Miss Lisa Tabone, Miss Jenean Hafza, Ms Chantelle Bartolo, Miss Nasha Kapadia, Miss Megan Guerrero and Miss HeatherGrosvenor.We also welcome Mrs Antonella Catalanotto as our new Senior Administration Manager.The enthusiasm and expertise of these new staff members has already been a valuable addition to our school. Over the next term we will be asking the children and the community to put their thinking hats on and start to create a picture of a mascot or symbol for our school. The mascot or symbol will not replace our traditional logo or emblem. Instead it will eventually become an image that represents our school values,aspirations and future directions.More details will follow in coming newsletters but in the meantime start to think of a plant, animal or symbol that epitomises our values of being respectful, proud and safe and also reflects the Vardys Road aspirations of every child trying to strive, thrive and engage.Good luck. I am sure there will be some great ideas.